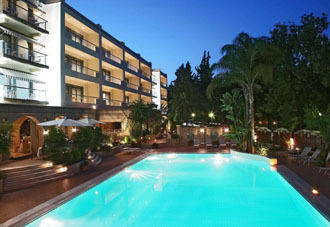 Located next to the Medieval City of Rhodes and among green parks, Rodos Park Suites Hotel captures the noble architecture of the medieval past with all the modern comforts and conveniences of a five star luxury hotel. Rodos Park Suites is member of the Small Luxury Hotels of the World and a recipient of the Best City Hotel of Greece award for 2006. 30 spacious rooms and 30 luxurious suites are tastefully furnished and appointed with all modern amenities. Suites and rooms have private balconies with view to the parks, Castle of the Knights and an archaeological area. 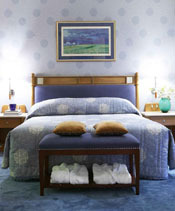 All guestrooms have mini bar, Pay TV system, direct dial phone, safe box, A/C and 24hrs room service. Suites are appointed with Jacuzzi and can be connected with a double room. The hotel boasts a wide and exclusive range of dining and entertainment facilities to satisfy the most discerning guests. The “Café Brasserie” restaurant is an excellent choice for dining any time of the day, serving International & Greek cuisine with view to hotel’s gardens and swimming pool. 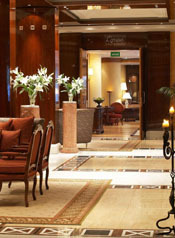 The “L’epoque”Lounge room is a cozy place with fire place ideal to enjoy a variety of tea and coffee. The Pool Bar & Restaurant is open during Summer next to the pool and among tall trees. 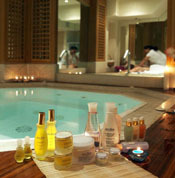 The Health & Spa Centre is equipped with sauna, hamam, Jacuzzi, Gym and offering big variety of facial & body treatments. The Business Centre is fully equipped with PC, Internet access and a multifunctional machine. The “Crystal Ballroom”is ideal for conferences, incentives and receptions for up to 300 seated persons. The L’epoque’ Meeting room is ideal for seminars and small meetings for up to 40 seated persons. Professional catering can be provided wherever is needed.